of people across the United States showed up to watch the mirror for the Hale Telescope travel from Corning Glass Works in New York to Palomar Observatory, California. It took a full year to polish Hubble’s primary mirror to the exact curve required, Connecticut, 1980s. While perfectly ground, the mirror had a tiny flaw, equivalent to 1/50th of an inch, which was only discovered when the first images were transmitted back from space. Pioneer of the distant stars. Edwin Hubble at the Palomar Observatory, near San Diego, where he developed his work on the expanding universe, 1950. The solar system .000000042 – 4 Light-Years from Earth The Milky Way 4 – 50,000 Light-Years from Earth Neighboring galaxies 50,000 – 5,000,000 Light-Years from Earth The Local Supercluster 5,000,000 – 100,000,000 Light-Years from Earth The Visible Universe 100,000,000 – 13,800,000,000 Light-Years from Earth Perched 350 miles above the Earth’s surface, astronauts Steven Smith and John Grunsfeld replace Hubble’s gyroscopes, 1999. 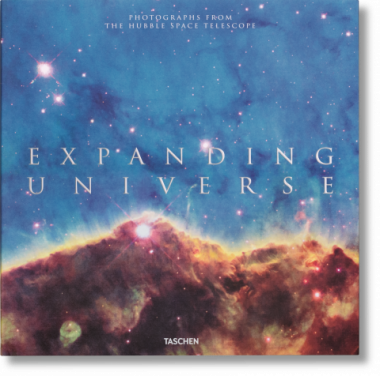 As the Imaging Group Lead at STScI’s Office of Public Outreach, Zoltan Levay transforms the complex data gathered from Hubble into photos and graphics that allow non-scientists to visualize the far reaches of the universe. OE: When did your interest in astronomy begin? ZL: I had a fascination with astronomy at least as far back as high school. I even built my own telescope when I was a teenager. So to be involved with Hubble is tremendously satisfying. OE: For a layperson, the Hubble images are really astonishing. But since you see them every day, does the romance of the discoveries fade? Not entirely. There’s always something new to see, even though working with the images inevitably brings a certain familiarity. I think the only way my colleagues and I might be somewhat blasé is that we keep wanting more spectacular images—it’s kind of the “get us another galaxy!” syndrome. OE: Astronomers calculate that the recently photographed galaxy observed in an image of the galaxy cluster Abell 2744 was formed 500 million years after the Big Bang. Will we eventually see photographs that are of objects even farther away, even closer to the moment when the universe formed? With Hubble and the James Webb Space Telescope, we’ll probably see farther than we have up until now, but we can only get so close in time to the Big Bang, because for a period of time the universe was opaque. The Webb will eventually see the point at which stars began to form and light appeared, but that will be the limit. OE: Since the fifth astronaut service of the Hubble in 2009 was the last, what’s the prognosis for the continued functioning of the telescope? Very good. The batteries, gyroscopes, and other components are in good shape, so it’s likely that we will be gathering data for at least another five years. By then, we’ll have the Webb telescope up. OE: You had already been working with the Hubble for several years when the fifth repair and upgrade mission was cancelled following the disintegration of the shuttle Columbia in February of 2003 and the loss of its seven crew members. This essentially doomed the telescope. How did you feel? It was a blow, of course. Everything was ready to go: all the replacement parts were in place and the astronauts were willing to take the risk. But after the tragedy of the Columbia and the loss of its crew, the decision was understandable. OE: Then came a public outpouring of support for a fifth mission, and Congress got involved, so the new NASA director reinstated the mission. Why do you think so many non-scientists cared so much about a space telescope? Was it the images? A lot of the credit goes to Senator Barbara Mikulski and others for pushing for a fifth mission. And the photographs had an effect, I’m sure. Astronomy has always been visual, and NASA has a mandate to educate the public about what its missions are doing. Many of the photos were published to accompany announcements of Hubble’s science results, and they amazed a lot of people. But also, I think, the fact that the Hubble was imperfect at first, and that engineers on the ground and astronauts in space had to fix it, gave it a more human quality than simply an unmanned satellite in orbit. The Hubble story was compelling for that reason. I think it would have been less captivating if everything had gone well right from the start. That fifth mission was, however, the last. OE: Let’s talk about the aesthetics of the images. Is the color that’s added to the photos really more for the public than the astronomers? The scientists don’t usually use the color images directly. Color is very important in astronomy, but scientists measure the color and other quantities numerically from the data. They can use the [monochrome] photos to see the shapes of things. The pictures are really a by-product of cutting-edge science. In fact, a conventional camera that produces color images means a trade-off with spatial resolution. But astronomers can be as inspired by the photographs as anyone else. OE: So what we see in the color pictures isn’t what we’d see if we were in a spaceship approaching the object in the photograph? It’s true that these formations aren’t what we would see with our eyes, but the fact is our eyes can’t see much of what the Hubble shows us, since it’s such faint light and it uses not only visual light but also infrared and ultraviolet. The colors aren’t arbitrary, however. The basic colors are driven by the data. We adjust the tonalities to include as much information as possible. We’re trying to have the colors as close as possible to the natural range. OE: In a crowded nutshell, can you describe the process? Every year, thousands of astronomers from around the world apply to use Hubble. Around 200 are selected every year. The observations are planned and scheduled at the Space Telescope Science Institute (STScI), and commands are sent to Hubble from the control center at NASA’s Goddard Space Flight Center, which operates the telescope. First, Hubble obtains an exposure. This is a complex process, but think of it as pressing the shutter button on a camera, where the exposure time can last anywhere from a few seconds to many minutes (and when separate exposures are combined digitally, it can extend to many days total). The data eventually ends up at the STScI, where we translate it into scientifically meaningful units and archive the data for scientists to use in their research—we’re talking something like 120 gigabits of data every week. OE: This is the point where you come in, right? Once the data are in the Hubble archive? Exactly. Yes, sometimes astronomers send us data to illustrate news announcements of interesting Hubble research. We also mine the data archive for interesting observations. While the images are still black and white, we adjust for the range of tones and intensities to emphasize important features. This isn’t unlike the process of adjusting exposure in a darkroom when printing from a negative. Here is where we apply color, using several versions of the image made with different filters. We use primary colors—red, blue, and green—in the same way any color technology is used—in a computer monitor, for instance. OE: What do the colors represent, if not exactly what one would see? The colors are assigned according to wavelengths, the longest being red, the shortest blue, and whatever falls in between, green. And when the separate images are combined, the color image you see arises from processing analogous to what happens in normal digital photography, and from there we make adjustments to arrive at the best image. Since Hubble’s cameras have a rather tiny field of view, we sometimes stitch together several images to make a mosaic to cover a larger field. OE: Is the Hubble team the first to produce color images like these? No, we’re continuing a long tradition. David Malin, the English-Australian astronomer, has been doing color work since long before Hubble at the Anglo-Australian Observatory in Sydney, using glass plates. We use very much the same techniques to produce color pictures. Of course, we have the power of the Hubble to work with, but excellent optics, computers, and software are so accessible today that many amateurs are now doing terrific work. OE: The distances that these photographs represent are so immense—millions and billions of light-years—that it’s surprising even astronomers can comprehend them. How can non-scientists understand the vastness of the universe? It’s a matter of scale. You start with our Solar System, which much of the public has a good sense of after seeing Voyager’s amazing pictures. And then you just keep going out. Astronomers talk about a distance ladder, a kind of bootstrap project where you develop incrementally a way of imagining normally unimaginable distances. One light-year is enormous, but along with the parsec—which astronomers prefer—it’s a convenient way to measure distance, just like the meter or the yard. OE: Since the farther we see in space means the further back in time we travel, how can we know what those very distant galaxies are like today? The universe appears to be roughly the same everywhere, so we can theorize that the galaxies far away in space and time will have evolved into galaxies similar to our Milky Way or other galaxies nearby. OE: If the Hubble, the Webb, and even more powerful telescopes of the future can’t show us the nanoseconds and milliseconds after the Big Bang, the period that you describe as “opaque,” does that put the theory of the Big Bang into some unprovable realm? I’d love to get rid of that word theory, since there’s so much misunderstanding of what scientists, whether astronomers or evolutionary biologists, mean when they use it. Among the large majority of astronomers, the concept of the Big Bang isn’t debated. Only the details are debated, and that will continue as we learn more about the universe. For instance, at one time astronomers proposed that the expanding universe would run out of energy and that the force of gravity eventually would collapse everything, leading to a repeat of the whole process. Now it’s been determined that the expansion of the universe is actually speeding up, not slowing down, and that dark energy will keep the expansion going forever. OE: If the idea of the Big Bang, of an unimaginable nothingness into which the universe expanded, is difficult for us mere mortals to understand, isn’t the notion of a universe that doesn’t follow the forces and cycles of nature we see around us every day almost beyond baffling? The life cycle of the universe is a compelling narrative. When you’re looking at deep space, moving closer to the origin of everything, things become more and more counterintuitive because we have no experience that helps us understand time scales so vast, and forces so different from those we encounter on Earth. We have experience with magnetism and gravity, but things like dark energy and dark matter are just not relevant to our lives. Nevertheless, these processes produced us. As Carl Sagan once said, “We’re made of star stuff. We are a way for the cosmos to know itself.” The photographs from Hubble will always help us explain our place in the universe.